It's not a secret anymore that I love bags for a long time and my most favorite bag brand today is Timbuk2; and yes, I have a personal fable for the bags from San Francisco. Somehow, a gadget user, traveler and professional has to carry all the stuff, like during this week's Mobile World Congress in Barcelona, and Timbuk2 gave me from day one what I was looking for. A fashionable, customized looking messenger bag which is different from other bags. Somehow, or better thanks to social media, Timbuk2 recognized, that I'm one of their bigger fans on the other side of the pond and they invited me last year to visit their HQ whenever I'll be in San Francisco. Thanks to Frequencies by HTC, I was in town earlier last month and therefore I took the chance to meet with the folks from Timbuk2, namely with Noel, Timbuk2's community manager. Located in a former garage in San Francisco's Mission district, the Timbuk2 headquarter with attached factory was exactly what I expected: A stylish and inspiring place to work at. Founded back in 1989 by Rob Honeycutt, a San Francisco bicycle messenger who purchases a used Singer sewing, everything started with a total investment of US$ 200 only. His first product, he sewed in his leisure time, were 50 black handlebar bags he sold at one bicycle shop in San Francisco. Since he was still working as a bike messenger (and that's where Timbuk2's love for messenger bags and everything bicycle-related comes from), he noted how many non-messengers asked him where they can buy a messenger bag like he carried. Rob seized the opportunity and built his first messenger bag: Scumbags - the initial name of his company - was born. In 1990 Rob decided that Scumbags lacked the necessary credibility of a real bag company and inspired by the legendary African city Timbuktu (the one which was often in the news recently) and a popular indie band of that time - Timbuk3, the name Timbuk2 was born. All materials which were required to make a bag were kept within arms' reach of the sewing machine and every single bag was made-to-order. As Noel told me during my visit, at these early days friends already asked for custom designs which therefore became the heritage of today's Timbuk2. Later in 1991, Rob doodled the original Timbuk2 swirl logo on a cocktail napkin with a felt-tip marker (it was only modernized in 2003). The next milestone of Timbuk2 was the year 1994 when Rob became a student of mass customization and the lean manufacturing philosophy of Toyota. He perfected the three-panel bag design for production - which is used until today - since Timbuk2 introduced its signature three-panel, tri-color messenger bag design in 1994 which encouraged bike shops and consumers to design custom bags with Timbuk2's "Build Your Own Bag" order form. In 1999, Timbuk2 began its work on an Internet version of its custom bag order form which was launched in 2000. Since then, Timbuk2 has introduced a lot of different bag series, some of them mass manufactured in China, but the custom bags are still hand made in San Francisco; with most of them sewed in the HQ I've visited. The headquarter divides into two sections: the front section with the office and the back section with the factory, where all the custom bags - hand made in San Francisco - are sewed. In the front part is the product design and management, customer service and administration. While the back part has the magazine, fabrics cutting, the sewing line and parcel pick-up. The office is this kind of inspiring open office you would expect from such a creative company, even if Timbuk2 is everything but a start-up anymore. And Timbuk2 was even kind enough to offer me a sneak-peek into its upcoming product line (good stuff and designs are coming - promissed). The production line in the back part is still heavily influenced by Rob's studies of Toyota's lean manufacturing philosophy and like when he began with his Singer, every piece of custom made bags is still within arms' reach of the sewer which mostly work for Timbuk2 for over 10 years now. Interesting enough, Noel told me that only a few of the hand made bags manufactured and shipped last year were looking the same, especially the black/black/black messenger back from hard-core fans which wanted to get a San Francisco original. But all other bags differed to each other which means you will rarely find a custom messenger bag twice. The tour ended at Timbuk2's kitchen bar were Noel served me a fresh tap beer, another fact which makes Timbuk2 so sympathetic since the guys at Timbuk2 are totally into beer - like me. And an interesting side note was the fact that every year one employee is responsible for the beer selection. He/she can select the brand but has also to take care that there's always enough beer at the office. This year, a Hawaiian beer is served which was pretty tasty. 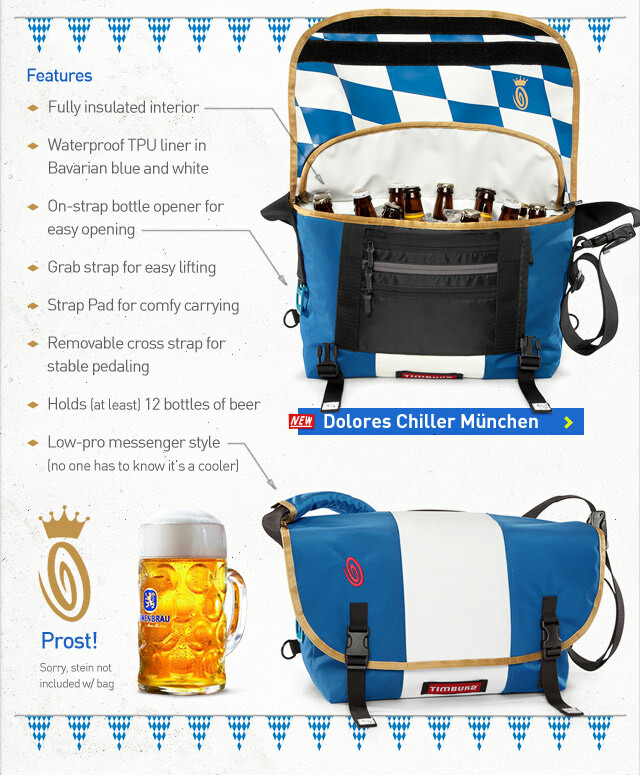 No wonder, Timbuk2 brought the Dolores Chiller to the market, which sold pretty well last year as the Dolores Chiller München and - I can unveil here - which will receive an update this year! Timbuk2 bags are by far not the cheapest messenger bags you can get, especially not if you have to import the custom messengers from the U.S. and have to pay tax and duties, but in my humble opinion it's worth since they are still the best looking and most functional messenger bags available. Doesn't matter if it's a classic messenger, a laptop messenger or just a market tote (maybe even with a laptop compartment), it's the small details which makes Timbuk2 bags so useful; not to mention the lifelong guarantee you have on their bags but franks - who wants to get a used messenger repaired or even exchanged, which which have seen the world with you? Since the early 2000s, my messengers have seen with me Europe, Asia, Africa and North America and I'm not giving away a single bag, even if I bought a new one in San Francisco which will now explore the world with me.